Stars are arranged in your zodiac constellation on this delicate sterling silver pendant. She was looking for a sign. Luckily, it came in the form of Mary Steratore's sterling silver necklaces. 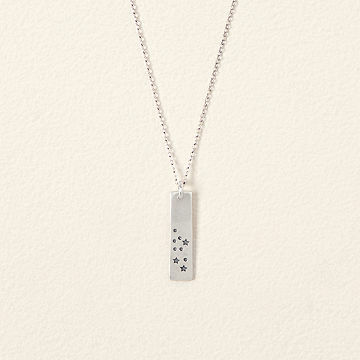 A delicate rectangular pendant features stars formed in your zodiac constellation and comes with a card highlighting your galactic-given attributes. Besides "amazing," of course. Made in Pittsburgh, Pennsylvania. I am in my 40's. If my fingers develop any sort of arthritis, I am not sure I will be able to wear this necklace because of the clasp. My grand daughter LOVED this gift and said she would wear it everyday. It's thin, flimsy and tangles easily. I'm afraid there's no saving grace with this one. I really liked that the chain of the necklace is adjustable from 16 to 18 inches, since the necklace is a gift for a young girl. She can adjust it to a shorter length as appropriate for her, or according to her preference. She hasn't taken it off since I gave it to her with her Christmas presents. Her mom and sisters received one also and they all are wearing this necklace daily. I'm so happy they love them as much as I love mine! It was a little but smaller than I expected, but was well made and the recipient absolutely loved it. My granddaughters ages 11, 14 and 18 immediately had to put them on. The necklaces are delicate and so impressive. I also gave my daughter one and I liked them so much that I have one ordered for myself. These look good if you're dressed up or on the beach. They are so sweet!